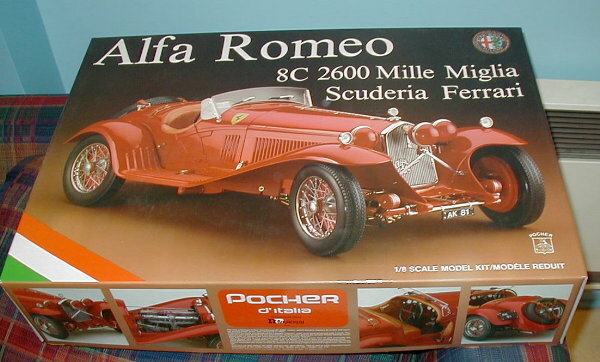 Pocher K81 Alfa-Romeo 8C 2600 Mille-Miglia Scuderia Ferrari 1/8 scale model kit! This is the latest iteration of the K73 Alfa Romeo Touring kit from Pocher. The kit was modified with the reduction of one spare tire and removal of the vertical wing in the back. A set of red light covers were added, as well. All other parts are the same as on the original K83 kit. The instruction booklet is improved as it includes photographs and not just drawings of the model.